“Our broken, outdated immigration system is putting our friends and neighbors at risk. 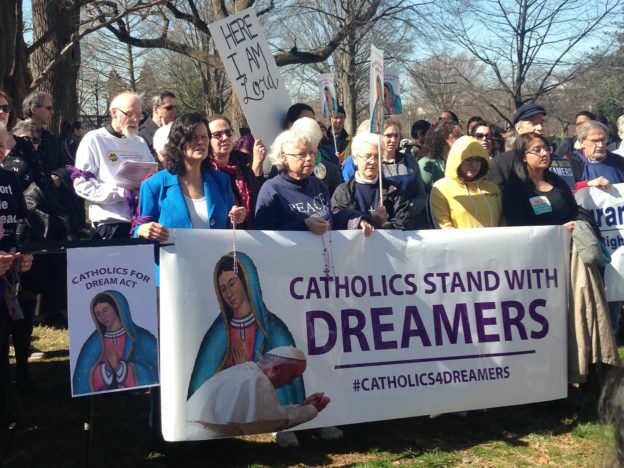 The Catholic Sisters and activists of NETWORK support the Dream Act and the SECURE Act because they protect Dreamers, TPS, and DED holders and provide an eventual pathway to citizenship. These bills reflect the Catholic social teaching that recognizes human contribution and inalienable worth. We’re hopeful that Congress will do the right thing and protect all immigrants. “For DACA recipients like me, March has been a month filled with hope. The House has introduced the Dream-Promise Act, and today the Senate introduced the Dream Act of 2019 and SECURE Act. These bills give 2.5 million Dreamers, TPS, and DED holders hope that the nightmare the Trump Administration put us through will soon be over. This entry was posted in Front Page, Immigration, News Item on March 26, 2019 by Lee.